We all know what can happen when lightning hits your home and your television gets fried. Well, a similar thing can happen when you plug your RV into a faulty power box at a campground. If there is a fluctuation in power coming into your RV camper or the power goes on and off, your electrical appliances may be wiped out. It is far cheaper to purchase a power surge protector than replace or repair your appliances. When you park in RV campgrounds that have too little, too much or fluctuating voltage at the electrical hook up, your electrical appliances are at risk unless you have a surge protector. This is not as uncommon as you may think. These fluctuations or surges in power can create havoc with your electrical systems and result in costly repairs or replacements. A power surge protector or guard can protect your RVs electrical system and appliances from being fried. A surge protector automatically shuts off the power coming in to your RV when it senses an improperly wired pedestal at your site. It shuts off when the power surges, or when it detects low or high voltage. Once the voltage is within safe parameters the power is restored to your RV. Some surge guards have a time delay built in to protect air conditioner compressors from turning on right away after being shut down. It allows for AC head pressure to "bleed off" first. Click here to view the best RV surge guard / protectors at competitive prices. 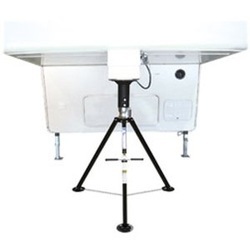 If you are concerned about the shaking, motion that your fifth wheel camper trailer exhibits this is the article for you to read. You may have noticed that when you wash and dry clothes or your kids and/or grandkids run through the fifth wheel it begins to shake. The bad news is you are not going to be able to get rid of the shaking entirely because of the flexibility of the camper design and the evolving ground surface. However, the good news is you are able to reduce the shaking significantly. A fifth wheel king pin tripod stabilizer can help reduce this shaking movement up to 95%. In this article today, we are going to tell you more about the features of king pin stabilizers and much more. By the time you finish reading this article you will be able to purchase a fifth wheel stabilizer that will meet your expectations. The first thing you want to analyze before purchasing a king pin stabilizer is its performance. You want to make sure that it will decrease the shaking movement that you are bound to be frustrated with. Keep in mind there is no product available that can eliminate the shaking completely yet you want to make sure that you are going to purchase the product that reduces it the most. The next thing you want to consider is how easily it can be set up. You want to make sure that you go for king pin stabilizers that you can set up without assistance in just a few moments. Height adjustment and lifting capacity is another thing to consider. You want to make sure that your fifth wheel over hang height and weight are similar to the tripods capacity. Be sure to be aware of the warranty that comes from the manufacturer. Lastly, you should be concerned about the price. You will be spending more for heavy-duty stabilizers. Keep this in mind when you see low priced products, especially if you want the maximum amount of the shaking motion to be eliminated from your life. 2. Easy to set up – You should go for a tripod stabilizer that can be set up in a few moments by one person. 3. Height adjustment and lifting capacity. Compare your fifth wheel overhang height and weight to the tripod capacity. 4. Price - a good price range for a quality king pin stabilizer is $100-$200. 6. Research and shop online. Comparison shop before making a decision so you can make a smart and informed choice. As an avid camper, I look for products that make my camping experience better.